This rough and rugged folder is designed to offer tactical performance for the Free Mason who wields it. The 3 1/2 in. blade is forged from stainless steel with deep blade serrations. 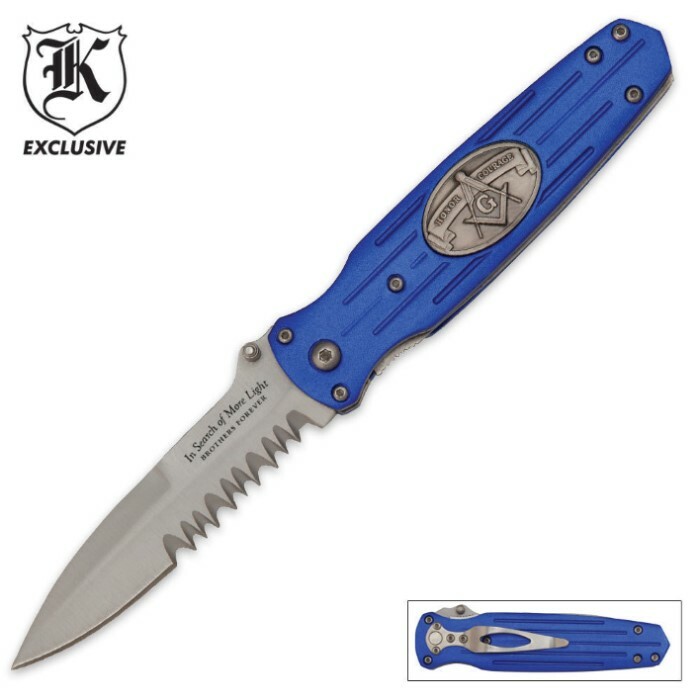 The impact resistant blue aluminum handle is equipped with the Masonic crest and a pocket clip. 8 1/8 in. overall. I received this knife five days after ordering it. I got this stiletto type liner lock for a sale price of $4.98 with a special $4.99 shipping charge so how could I go wrong? I didn't! What a bargain! This knife has aluminum handles and a sharp bead-blasted stiletto type blade and a strong pocket clip. The blade locks up tight with absolutely no play at all. Yes, it was hand-crafted in China which doesn't always mean fine quality but with this knife it is definitely not an issue, it's made well and should last for many years of service. You don't have to be a Mason to enjoy this deal and after receiving mine I plan on buying the red Firefighter knife of the same design. It makes for a great everyday pocket knife or as a gift to any Mason that you might know. For a gift they will think you spent a lot of money on them. My advice is to grab up a couple while they are still on sale.